A Knifty Knitter is a weaving loom that enables you to create knitted items like hats, scarves and blankets without the traditional use and challenge of knitting needles or a crochet hook. This colorful plastic knitting frame transforms ordinary yarn into a variety of knit items. 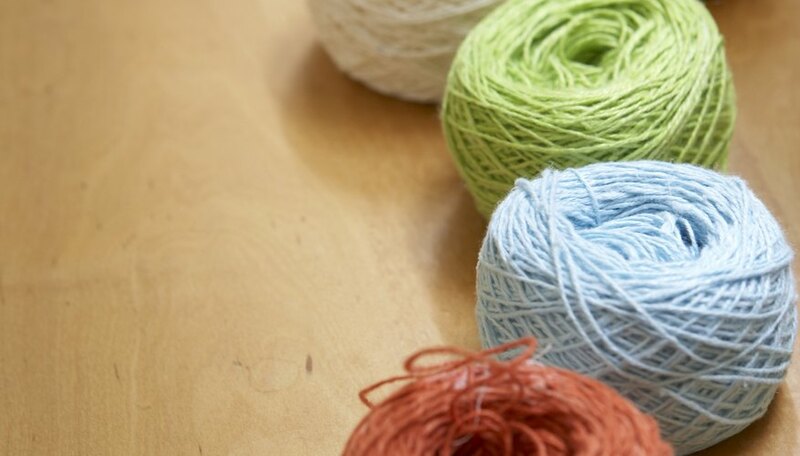 If you decide to use different colors in your project, you need to change yarn colors while knitting. Complete the knitting row that you are working on with the current yarn color. Leave a tail of of the old yarn color that is 6 inches long secured to your hitch peg, or end peg. You will use this extra yarn to transition to the new yarn color. Join the two different colors of yarn together by tying a loose knot or by twisting the two yarn pieces together. The pieces need to stay joined long enough so that you can begin knitting again with the new yarn color. Knit the next row, using your new color yarn. You may need to hold the two yarn tails together and maintain tension while you do this to ensure that the two tails do not become unraveled. The risk of unraveling will decrease by the time you have completed the first row of the new color. Complete your second row with your new yarn color on the Knifty Knitter. Separate the two yarn tails carefully. You will need to pull both tails through your knitted piece so that they are both sticking out of the wrong side (back side) of your work. Tie the two ends of yarn into a knot making sure that the knot is well hidden in the side of the knitted piece. You may need to pull or adjust the yarn slightly to help it blend in naturally. The edges are one of the best places to hide knots or yarn tails. Thread the yarn tails into the yarn needle and weave them into the knitted piece about two inches to secure and hide them. Trim the excess yarn. Use the same weight yarn when you change colors so that it doesn't affect the shape of your knitting. Avoid wrapping the yarn too tightly while knitting with the Knifty Knitter. Ginger Kelly has been an accomplished professional writer since 1997. She began her career writing for school newsletters and newspapers, then moved on to community newspapers. Kelly has written various articles on a variety of topics ranging from parenting to health care. She is a paralegal graduate of Blackstone College.